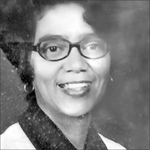 Obituary for Helen L. Robinson | McGuire Funeral Service, Inc.
HELEN L. ROBINSON, 93, of Washington, DC, was a retired DC Public Schools educator. She was predeceased by her husband, Wadsworth Robinson; brother, John Wilkinson and sister, Antoinette Tapscott. She is survived by her three children, Clarence Holmes, Jr., Kathleen Hill and John K. Holmes; four grandchildren; six great-grandchildren; two sisters, Judy Payne and Barbara Watford; a host of nieces and nephews; other relatives and friends.